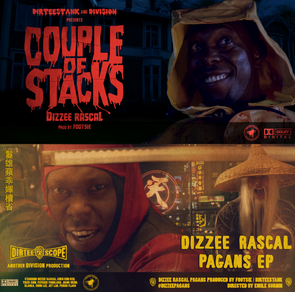 Dizzee Rascal returns with his new EP 'Pagans’, which features the elusive, gone for now Halloween themed video 'Couple of Stacks' as well as the ninja vibes of brand new title track 'Pagans'. Exclusively premiered by Noisey in the UK, both tracks were produced by UK grime artist Footsie, whilst visuals were handled by France’s Emile Sornin and produced by DIVISION. Initial video 'Couple of Stacks' disgusted the general public, won widespread props from critics and then disappeared without a trace three days later. 'Pagans' channels a demonic vision via a homage to the Kung Fu films of yesteryear and both showcase Dizzee's flow. It’s out now on Dirtee Stank Recordings and features the audio and video for both tracks as well as instrumental versions. Check it out below.